Trustee of the Portuguese congregation at Amsterdam in the beginning of the eighteenth century. He supported Solomon Ayllon against Ẓebi Hirsch Ashkenazi. Ayllon convinced Pinto that it was his duty to uphold the superiority of the Portuguese community over the Ashkenazim. He thus helped greatly to protect Nehemiah Ḥayyun and to persecute Ashkenazi. Pinto and Ayllon even suggested that Ashkenazi should be cited before the Portuguese council, which, since he did not heed the summons, excommunicated him. 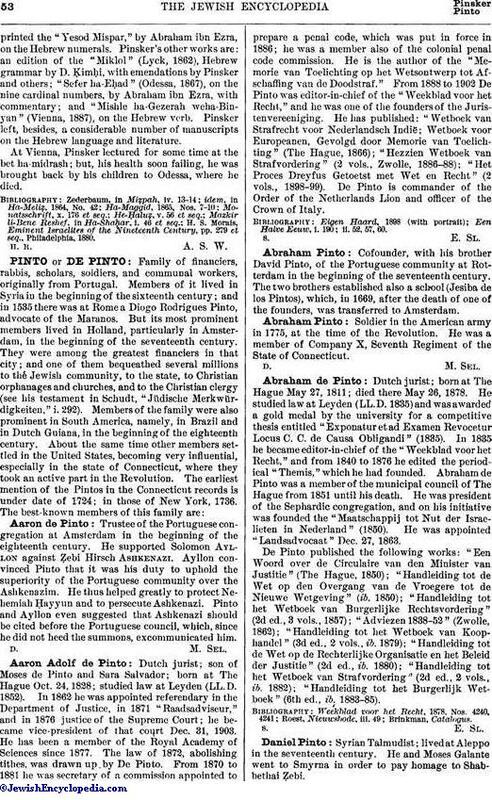 Dutch jurist; son of Moses de Pinto and Sara Salvador; born at The Hague Oct. 24, 1828; studied law at Leyden (LL. D. 1852). In 1862 he was appointed referendary in the Department of Justice, in 1871 "Raadsadviseur," and in 1876 justice of the Supreme Court; he became vice-president of that court Dec. 31, 1903. He has been a member of the Royal Academy of Sciences since 1877. The law of 1872, abolishing tithes, was drawn up by De Pinto. From 1870 to 1881 he was secretary of a commission appointed to prepare a penal code, which was put in force in 1886; he was a member also of the colonial penal code commission. He is the author of the "Memorie van Toelichting op het Wetsontwerp tot Afschafling van de Doodstraf." From 1888 to 1902 De Pinto was editor-in-chief of the "Weekblad voor het Recht," and he was one of the founders of the Juristenvereeniging. He has published: "Wetboek van Strafrecht voor Nederlandsch Indië; Wetbock voor Europeanen, Gevolgd door Memorie van Toelichting" (The Hague, 1866); "Hezzien Wetboek van Strafvordering" (2 vols., Zwolle, 1886-88); "Het Proces Dreyfus Getoetst met Wet en Recht" (2 vols., 1898-99). De Pinto is commander of the Order of the Netherlands Lion and officer of the Crown of Italy. Een Halve Eeuw, i. 190; ii. 52, 57, 60. Cofounder, with his brother David Pinto, of the Portuguese community at Rotterdam in the beginning of the seventeenth century. The two brothers established also a school (Jesiba de los Pintos), which, in 1669, after the death of one of the founders, was transferred to Amsterdam. Soldier in the American army in 1775, at the time of the Revolution. He was a member of Company X, Seventh Regiment of the State of Connecticut. Dutch jurist; born at The Hague May 27, 1811; died there May 26, 1878. He studied law at Leyden (LL.D. 1835)and was awarded a gold medal by the university for a competitive thesis entitled "Exponatur et ad Examen Revocetur Locus. C. C. de Causa Obligandi" (1835). In 1835 he became editor-in-chief of the "Weekblad voor het Recht," and from 1840 to 1876 he edited the periodical "Themis," which he had founded. Abraham de Pinto was a member of the municipal council of The Hague from 1851 until his death. He was president of the Sephardic congregation, and on his initiative was founded the "Maatschappij tot Nut der Israelieten in Nederland" (1850). He was appointed "Landsadvocaat" Dec. 27, 1863. De Pinto published the following works: "Een Woord over de Circulaire van den Minister van Justitie" (The Hague, 1850); "Handleiding tot de Wet op den Overgang van de Vroegere tot de Nieuwe Wetgeving" (ib. 1850); "Handleiding tot het Wetbock van Burgerlijke Rechtsvordering" (2d ed., 3 vols., 1857); "Adviezen 1838-52" (Zwolle, 1862); "Handleiding tot het Wetbock van Koophandel" (3d ed., 2 vols., ib. 1879); "Handleiding tot de Wet op de Rechterlijke Organisatie en het Beleid der Justitie" (2d ed., ib. 1880); "Handleiding tot het Wetbock van Strafvordering (2d ed., 2 vols., ib. 1882); "Handleiding tot het Burgerlijk Wetboek" (6th ed., ib. 1883-85). Syrian Talmudist; lived at Aleppo in the seventeenth century. He and Moses Galante went to Smyrna in order to pay homage to Shabbethai Ẓebi. Cofounder, with his brother Abraham, of the Portuguese community at Rotterdam. A rich broker of Amsterdam in the eighteenth century who sided with Jonathan Eybeschütz in his controversy with Jacob Emden. Hühner, in Publ. Am. Jew. Hist. Soc. xi. 88 et seq. Dutch captain of the beginning of the eighteenth century. At the head of a company of Jews, Pinto in 1712 heroically defended the village of Savanna in Surinam and beat off the French under Cassard. Southey ("History of Brazil," ii. 241) speaks of a captain named Pinto, who, when the Dutch were for the second time besieged at Recife, defended the fort single-handed, until, overwhelmed by superior numbers, he was obliged to surrender. He is probably identical with the subject of this article. Simon Wolf, The American Jew as Patriot, Soldier, and Citizen, p. 452. 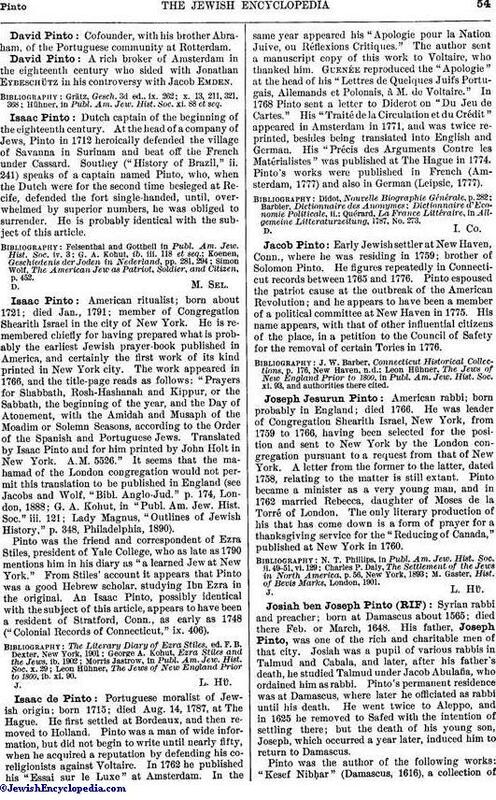 American ritualist; born about 1721; died Jan., 1791; member of Congregation Shearith Israel in the city of New York. He is remembered chiefly for having prepared what is probably the earliest Jewish prayer-book published in America, and certainly the first work of its kind printed in New York city. 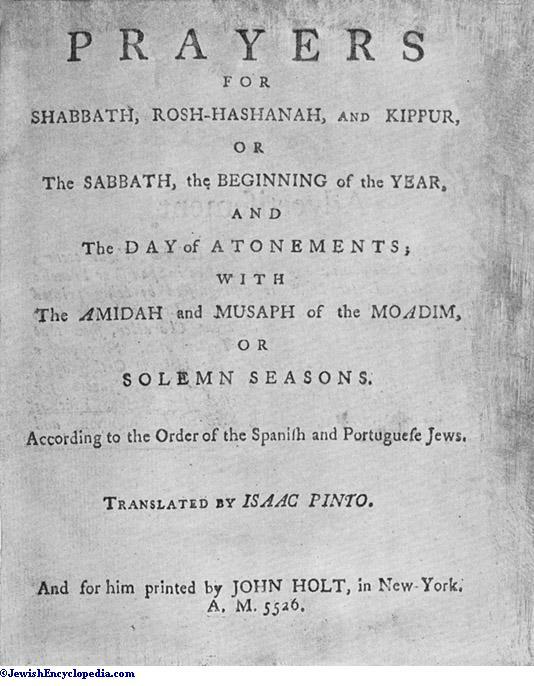 The work appeared in 1766, and the title-page reads as follows: "Prayers for Shabbath, Rosh-Hashanah and Kippur, or the Sabbath, the beginning of the year, and the Day of Atonement, with the Amidah and Musaph of the Moadim or Solemn Seasons, according to the Order of the Spanish and Portuguese Jews. Translated by Isaac Pinto and for him printed by John Holt in New York. A.M. 5526." It seems that the mahamad of the London congregation would not permit this translation to be published in England (see Jacobs and Wolf, "Bibl. Anglo-Jud." p. 174, London, 1888; G. A. Kohut, in "Publ. Am. Jew. Hist. Soc." iii. 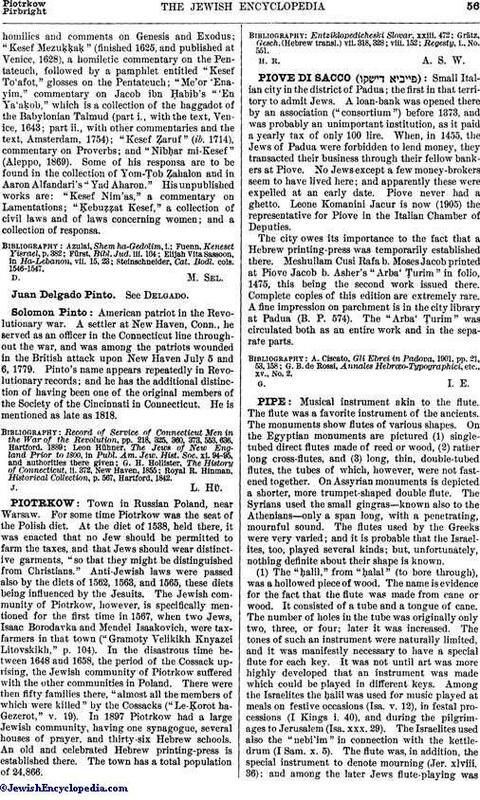 121; Lady Magnus, "Outlines of Jewish History," p. 348, Philadelphia, 1890). Pinto was the friend and correspondent of Ezra Stiles, president of Yale College, who as late as 1790 mentions him in his diary as "a learned Jew at New York." From Stiles' account it appears that Pinto was a good Hebrew scholar, studying Ibn Ezra in the original. An Isaac Pinto, possibly identical with the subject of this article, appears to have been a resident of Stratford, Conn., as early as 1748 ("Colonial Records of Connecticut," ix. 406). Leon Hühner, The Jews of New England Prior to 1800, ib. xi. 90. Portuguese moralist of Jewish origin; born 1715; died Aug. 14, 1787, at The Hague. He first settled at Bordeaux, and then removed to Holland. Pinto was a man of wide information, but did not begin to write until nearly fifty, when he acquired a reputation by defending his co-religionists against Voltaire. In 1762 he published his "Essai sur le Luxe" at Amsterdam. In the same year appeared his "Apologie pour la Nation Juive, ou Réflexions Critiques." The author sent a manuscript copy of this work to Voltaire, who thanked him. Guenée reproduced the "Apologie" at the head of his "Lettres de Quelques Juifs Portugais, Allemands et Polonais, à M. de Voltaire." In 1768 Pinto sent a letter to Diderot on "Du Jeu de Cartes." His "Traité de la Circulation et du Crédit" appeared in Amsterdam in 1771, and was twice reprinted, besides being translated into English and German. His "Précis des Arguments Contre les Matérialistes" was published at The Hague in 1774. Pinto's works were published in French (Amsterdam, 1777) and also in German (Leipsic, 1777). Quérard, La France Littéraire, in Allgemeine Litteraturzeitung, 1787, No. 273. Early Jewish settler at New Haven, Conn., where he was residing in 1759; brother of Solomon Pinto. He figures repeatedly in Connecticut records between 1765 and 1776. Pinto espoused the patriot cause at the outbreak of the American Revolution; and he appears to have been a member of a political committee at New Haven in 1775. His name appears, with that of other influential citizens of the place, in a petition to the Council of Safety for the removal of certain Tories in 1776. 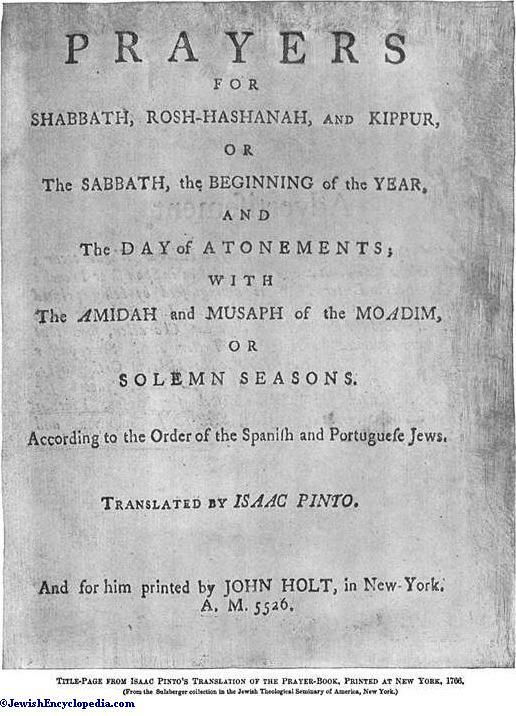 Leon Hühner, The Jews of New England Prior to 1800, in Publ. Am. Jew. Hist. Soc. xi. 93, and authorities there cited. American rabbi; born probably in England; died 1766. He was leader of Congregation Shearith Israel, New York, from 1759 to 1766, having been selected for the position and sent to New York by the London congregation pursuant to a request from that of New York. A letter from the former to the latter, dated 1758, relating to the matter is still extant. Pinto became a minister as a very young man, and in 1762 married Rebecca, daughter of Moses de la Torré of London. The only literary production of his that has come down is a form of prayer for a thanksgiving service for the "Reducing of Canada," published at New York in 1760. M. Gaster, Hist. of Bevis Marks, London, 1901. Syrian rabbi and preacher; born at Damascus about 1565; died there Feb. or March, 1648. His father, Joseph Pinto, was one of the rich and charitable men of that city. Josiah was a pupil of various rabbis in Talmud and Cabala, and later, after his father's death, he studied Talmud under Jacob Abulafia, who ordained him as rabbi. Pinto's permanent residence was at Damascus, where later he officiated as rabbi until his death. He went twice to Aleppo, and in 1625 he removed to Safed with the intention of settling there; but the death of his young son, Joseph, which occurred a year later, induced him to return to Damascus. Title-Page from Isaac Pinto's Translation of the Prayer-Book, Printed at New York, 1766. Pinto was the author of the following works: "Kesef Nibḥar" (Damascus, 1616), a collection of homilies and comments on Genesis and Exodus; "Kesef Mezuḳḳaḳ" (finished 1625, and published at Venice, 1628), a homiletic commentary on the Pentateuch, followed by a pamphlet entitled "Kesef To'afot," glosses on the Pentateuch; "Me'or 'Enayim," commentary on Jacob ibn Ḥabib's "'En Ya'aḳob," which is a collection of the haggadot of the Babylonian Talmud (part i., with the text, Venice, 1643; part ii., with other commentaries and the text, Amsterdam, 1754); "Kesef Ẓaruf" (ib. 1714), commentary on Proverbs; and "Nibḥar mi-Kesef" (Aleppo, 1869). Some of his responsa are to be found in the collection of Yom-Ṭob Ẓahalon and in Aaron Alfandari's "Yad Aharon." His unpublished works are: "Kesef Nim'as," a commentary on Lamentations; "Ḳebuẓẓat Kesef," a collection of civil laws and of laws concerning women; and a collection of responsa. Steinschneider, Cat. Bodl. cols. 1546-1547. American patriot in the Revolutionary war. A settler at New Haven, Conn., he served as an officer in the Connecticut line throughout the war, and was among the patriots wounded in the British attack upon New Haven July 5 and 6, 1779. Pinto's name appears repeatedly in Revolutionary records; and he has the additional distinction of having been one of the original members of the Society of the Cincinnati in Connecticut. He is mentioned as late as 1818. Royal R. Hinman, Historical Collection, p. 567, Hartford, 1842.